Kate has inherited natural psychic abilities that have been passed down through her family for generations. She is also a healer. A private consultation with Kate gives insight into PAST EVENTS and how previous incarnations may affect your current life. 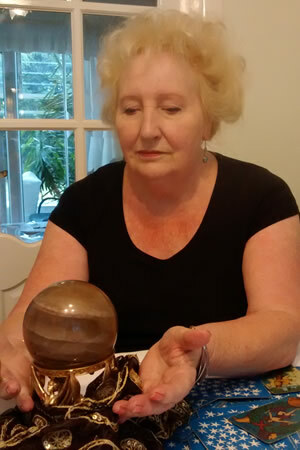 She also gives advice on Current Situations indicated by your palms, the Tarot cards, the Runes and the crystal ball and discusses with you how to make the best of the future indications for love / marriage, health, prosperity and happiness. Kate has many clients from all over the world who consult her on a regular basis.